Source: picked up an e book copy for free and received from authors for honest review. Scarlet Bone is a zombie girl with one big problem. It’s not that she’s missing a nose (zombie parts go missing all the time). It’s not that she’s turning 13 today and her parents just gave her a massive chore to do. It’s not even the stray arm she found in the street -- the one that’s giving her so much trouble. No, Scarlet’s problem is that she’s about to end up on the wrong side of a wolf: the inside. Welcome to the strange, yet strangely familiar world of the Plainfield Chronicles. In The Plainfield Chronicles: Scar and the Wolf, the series’ debut novel, you’ll find a story you recognize, but one you've never read before. A girl's parents tell her she needs to take a special package to Grandmother's house, deep in the woods. She puts on her red riding hood and sets out, alone. She encounters a wolf, and reveals to him what she's doing and where she's headed. She gets distracted on her journey and arrives late to Grandma's. Too late. Grandma? Is that you? Something seems amiss. What big ears you have.What big eyes you have.What big teeth you have. Scar and the Wolf is the Little Red Riding Hood for our time — one with zombies, music, and lost body parts just trying to find their way home. As of right now Scar and the Wolf is free for the Kindle. I loved this modern day re telling of Little Red Riding Hood! Scarlet is an unique and very interesting little girl that I really enjoyed reading about as well as reading to my sons about too. My four year loves zombies (not sure why since he has never watched anything with zombies in it) and the older boys don't really care either way about them. After I read the book, I just knew I had to read it to the boys out loud. The chapters are fun and not too long at all, so younger children can really enjoy the book without getting bored with it. Also, there isn't really anything bloody or gory in the plot line so it is great for younger kids too. One more thing: there were some parts that the boys liked to call "booger" parts. This means that there were some gross parts in it. Not gross gross; but funny gross. I know it is confusing but I have learned living with boys there is a difference. And yes, I did laugh at it too. I can't wait to read the next book and find out more about the other interesting characters as well as see what else happens to Scarlet, the surfing Grandma, and the rest of the funny little zombies. Plus I swear Scarlet is the cutest little zombie I have ever seen! Don't your think so? My mommy read this to me every night. There wasn't a lot of pictures but I thought the story was pretty funny. I liked the beetle box and when she cleaned out her nose holes. That was gross and me and all my brothers said, "EWWW!" at the same time. It was pretty funny. My dad likes to read the Walking Dead comic book but I am not allowed to look at that at all but I like Scar and the Wolf. Its like zombies for me. My dad read a chapter to me and told me now I have my own zombie book too. I like that a lot. I also thought Scarlet's Grandma was really cool. My grandma is cool like that too. She doesn't surf, though, but she does do a lot of other things like rafting. All I know about rafting is there is a boat and lots of water and it is rough. But I think everyone should read this book because it is really funny and the titles of the chapters are cool. 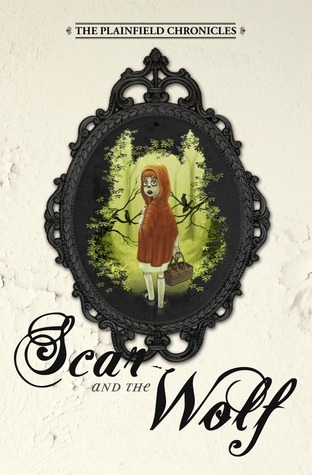 *Scar and the Wolf is our choice for the Kid Lit Blog Hop! If you are interested in this please visit Mother Daughter Book Reviews to find out how you can participate in this awesome hop for Kid Literature! Hi everybody! This is my first ever blog tour!! I am really excited that Mom (Read to My Heart's Content) had got us involved in this great blog tour. I want to say thank you to the author, H.B. Bolton, for sending us these books and signing them as well. 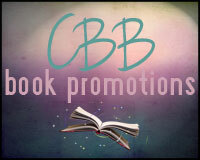 Also, thanks to CBB Book Promotions for giving me this chance to be a part of this adventure! So my mom wanted my brother, Conner, and me to read and review both books but Conner really got behind on the reading so I am the only one that will be sharing my thoughts here. Which I think that is completely okay because I get all of you to myself..bwahahahaha! I hope you have fun here and remember to visit the other blogs on the tour. And you can jump over to my mom's blog and see her thoughts on both books too. And be sure to visit the Tour Page at Candace's Book Blog to see the schedule! Evan and Claire Jones are typical teenagers, forced to go with their parents to yet another boring museum ... that is, until something extraordinary happens to make their day a little more than interesting. After following a strange little creature into a closed exhibit, Evan and his older sister, Claire, discover the Serpent’s Ring, one of the magical relics formed from the shattered Mysticus Orb. Purely by accident, they have awakened its powers and opened a portal to Sagaas, land of ancient gods. Before the siblings can comprehend what has happened, the Serpent’s Ring is wrenched from Evan’s hand by an enormous fish and flown back to Aegir, the Norse god of the sea. 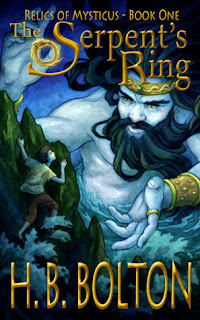 Evan and Claire, accompanied by a band of unlikely heroes, must retrieve the Serpent’s Ring before Aegir uses its immense powers to flood all the lands on Earth. I really really enjoyed The Serpent's Ring, book 1 in the Relics of Mysticus series. 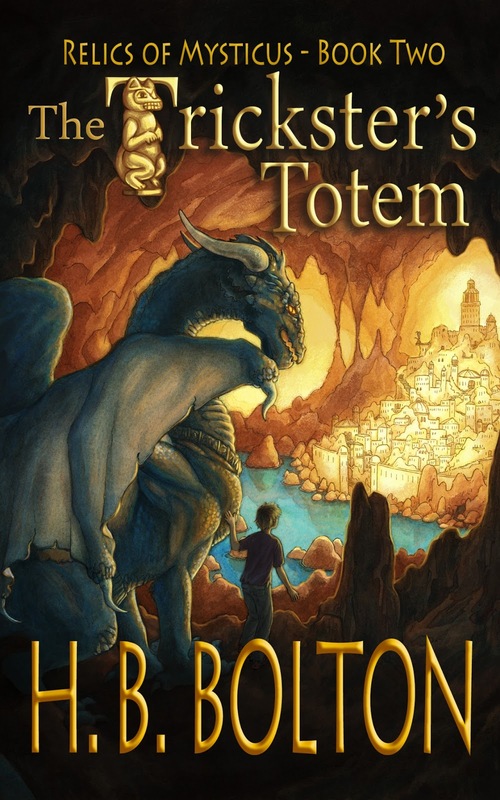 It reminded me a lot of the Percy Jackson series, especially with the mythology that is mixed in with the story. I also liked that the first book is based on characters from Norse mythology, instead of Greek or Roman. It seems like the Greek gods are more popular and used in a lot of books and I really liked learning about the Norse beliefs here instead. The characters, Claire and Evan, are brother and sister. I don't have a sister but I do have three other brothers and we argue a lot (or at least Mom says we do); Claire and Evan remind me of the relationship I have with my brothers. They argue and pick on each other but when the other is in trouble, they are right there checking to make sure everything is okay. Evan is super funny and I laughed a lot at some of his jokes throughout the story. Besides these two, I also liked Dunkle, especially when he gets scared or nervous. Stinky! When I think of it, I believe Conner and Dunkle have a lot in common. All of these characters go on a lot of adventures like visiting an island with giants, going to a place very similar to Atlantis, and trying to save the world. I loved the creativity the author shows with the different names of the food in Sagaas , as well as the powers Claire and Evan receive while on the journey. There is a little romance but nothing too bad, thank goodness. I think The Serpent's Ring is a great book for anyone 9 years and up. The only thing that would make this book better is if it had its own movie to go with it!! Life has returned to normal for fourteen-year-old Evan and his older sister, Claire. That is until Dunkle, a clever but stinky little imp, pays an unexpected visit to their school. He has come to take the siblings back to Sagaas, the mythical realm of the gods. Once again, a Relic from the ancient Mysticus Orb has fallen into the wrong hands. Only Evan and Claire, with their unique mystical abilities, can help find it. Through the power of the Trickster’s Totem, a coyote trickster has escaped. His laughter echoes throughout the realm, as he spreads mischief and mayhem. He burns an entire crop of popcorn, carves his grinning image into sacred artifacts, and things really get interesting when he shape-shifts into Evan’s friends. Claire and Evan must capture the Trickster, retrieve the Totem, and be careful not to become sidetracked by robotic Steampunk animals, “sweet” pixie-like Pains, and a problematic mermaid … all while dodging Mothman-like aces. Most surprising, Evan discovers the true reason dragons exist in the Native American Spirit World. I liked The Trickster's Totem too! I haven't learned much about the Native American mythology so reading this book was a little like doing school, but I swear it was fun too! There is adventure, though I didn't feel like there was as much as there was in The Serpent's Ring. Claire and Evan do gain more powers and learn something about themselves too in this book. I liked that Evan used his magic for good in the real world, even if he wasn't supposed to. He did some funny things with it to the bullies in school. There are some interesting creatures in this world too. I like how the author named the fairies "Pains" and it is really funny when Evan eats too much fairie food. Let's just say he loves to play jokes on people. Sometimes, though he does go to far and I think Evan could learn to be serious at the right times. We still see Dunkle in the story but no one else from the first book is in this one. Claire finds someone else to giggle at (Mom says I will understand this more when I get older...but I don't think I will ever like a girl giggling all the time) and Evan is bothered by a mermaid who likes to meddle in everyone's business. 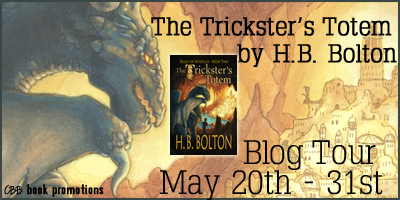 The Trickster's Totem is pretty good and it really teaches us about the Native American beliefs too. I liked it even though it seemed like it moved a little slow for me at times. Also, some of the disasters Mica creates are kinda of funny but I can still see the bad in them too. A magical part of H.B. Bolton’s childhood was being swept into worlds of enchanting characters, fantastical creatures and extraordinary powers—simply by picking up a book. As a mother and a teacher, she was compelled to create imaginary worlds of her own in order to share them, not just with her children, but with all children. H.B. Bolton lives in Florida with her supportive husband and two highly spirited children. Shh, can you keep a secret? 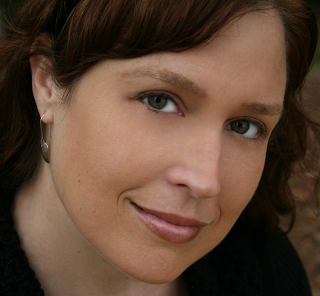 Not only does she write books for the young-at-heart, adventurous sort who yearn to dive into a good young-adult fantasy story, she also writes spellbinding, heart pounding women's fiction. These particular books are written under the name Barbara Brooke, but that's another story, altogether. I am having a hard time getting the rafflecopter to come up on here so please click here to get sent to the Rafflecopter or you can click the "Giveaway" word too. Good luck! Children's Book Week May 13-19, 2013: How are you Celebrating? Everyone here at Kids Corner For Super Reading are pretty excited about Children's Book Week that starts tomorrow, Monday May 13, 2013. Of course the kids (and the moms) here are always reading anyways but it is nice to have a whole week to dedicate to getting more kids out there to embrace reading and love it. Here is a little more about Children's Book Week and the website where you can visit for yourself. They offer a lot of interesting ideas to get your kids more involved and you can also pick up a poster by following the directions there. Children's Book Week is administered by Every Child A Reader, a 501(c)(3) literacy organization dedicated to instilling a lifelong love of reading in children. The Children's Book Council, the national non-profit trade association for children's book publishers, is an anchor sponsor. Definitely visit the website, www.bookweekonline.com, to see all the neat and cool things going on over there. We plan on visiting our library this week, as well as picking some books to donate to local charities for the children to start their love of books too. We will also be making a list of all the books we read during this week. What are you doing this year for Children's Book Week? "If You Were Me and Lived in...Mexico - A Child's Introduction to World culture," is the first intry in this educationalseeries that takes children on a journey to our exciting neighbor to the south... Mexico! 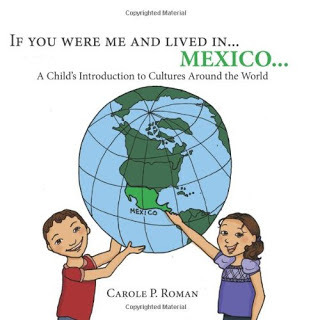 Perfect for children from Pre-K to age eight, this little book is a ground breaking new experience in exposing children to the joy of cultural differences. Happy Cinco de Mayo!!!! We just had a wonderful meal that was inspired by this Holiday and we each practiced our Spanish to each other! And to top it off, right before bed we are going to re-read If You Were Me and Lived In....Mexico. You can really see the love that Mrs. Roman has for teaching while reading this book. It is written simple and yet still manages to capture the reader's interest, insisting you keep turning the page to find out more all about what children in Mexico do everyday. It is easy to understand for your preschool children and still engages the minds of my soon to be fifth graders. Another thing I love about the way it is set up is the glossary at the back of the book. It tells you some of the Spanish words and gives their definition. This is great for us homeschooling moms who like to quiz our kids just to make sure they are paying attention. The pictures are eye catching and really helps show the day to day activities in Mexico. I enjoyed this book very much and I think it is a great way to get kids into learning more about girls and boys in different countries. It really shows us how even though we speak a different language and live in different places, there is a lot we have in common. **** When I was a child, I used to send off to get travel guides from all of the different states. Living in a small town in Georgia, I used to dream visiting all the places in the United States, then Canada, and finally going to Europe. Now that I think back on it, I believe I collected the travel guides because I loved reading about different places. This book just reminds me of that little tidbit of information from my childhood. I would definitely give If You Were Me and Lived In...Mexico five hearts, five stars, and five smiley faces. You pick! But you most definitely should pick up Mrs. Roman's books. She loves children and you can see it in the way she writes such wonderful books whether it be kids sailing the high seas or a nonfiction book teaching you about other children in the world. You will not be disappointed in these stories. Shelby Summers has a zest for life that can't be tamed... Tom Tucker has a dream of helping others who are facing the challenges he faced not too long ago. Join Shelby and Mr.T as they join forces to give back to their community, and be challenged to do the same for yours! Tom's T Hat Rack is a sweet adorable and fun book that brings all the heart-warming feelings we have inside us to the forefront. You can't help but feel good after reading this book. This story showcases all the best in human nature and makes you wish for more from the society that surrounds us in reality. The characters in this book are a special breed indeed. Shelby is such a sweet little girl that loves and cares about the people around her. She is always trying to see the good in folks and make their lives even more special. I think other children could really look up to Shelby in morals and her uplifting spirit. Tom Tucker is another great character in the story. He is a wonderful man that has faced many challenges and always remembers to smile as he thinks of others going through his own trials and struggles. These two together have made a very interesting story come alive teaching us, young and old, the importance of thinking of others instead of always considering "what's in it for me?" I also enjoyed the fact that story was based off a real person. It is good to know that there is a great part of humanity out there helping people cope with some very dire situations bringing a smile and a hug to them amongst their pain and suffering. 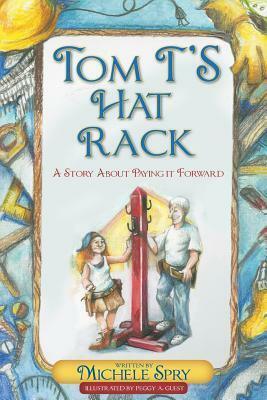 Tom's T Hat Rack is a great way to teach your kids how to pay it forward and make a difference in their hometown. I highly recommend giving this book a try. It is a wonderful written story with beautiful illustrations and a fantastic message that everyone can benefit from wholeheartedly. "Adventures with Buster" is a children's book that will entertain and educate readers about guide dogs and blindness. 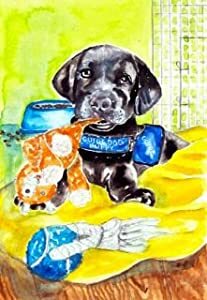 This is the first book in which London Lake Pickett shares experiences she has had with her guide dog named Buster. I loved this book so much! Instantly, I had this warm feeling spread over me as I started the book, mainly because of the respect and love you can feel the author has for this wonderful animal. These two are terrific characters! Buster is a fun and adorable friend to London. But he is also her guide dog and helper too. I love how London takes the time to explain to the readers what this entails and points out some very important things for us to know about guide dogs. She really takes us through the whole adventure of how her and Buster were brought together. We really feel like we are right there along with her. But Buster isn't the only character in this non fiction story that grabs our attention too. London is an amazing person who really shows us how much she truly loves Buster and enjoys her life with him. I really enjoyed the first time Buster meets a frog. That was very entertaining for me, as well as my children. The length of the book isn't too long so to keep young children engaged as well as older kids. It is very informative but also has an entertaining vibe to it too. I really loved this story and definitely recommend it to children, adults and everyone in between! My favorite animal in the whole universe is dogs so I really liked this book! My mom read it to me aloud and I learned a lot about what to do and not to do when seeing a guide dog. Never try to pet a guide dog when they are working! This could cause them to do something bad and not pay attention to their job. I remember that! I also liked all the different commands Buster knew. He really is smart! My dog only knows how to sit, lay down, and sing. So Buster is pretty cool! I learned a lot while reading Adventures with Buster about guide dogs and training them. Buster is a very well trained animal that completely ignored cats while leading Ms. London down the street. Most dogs have to at least bark at cats, if not chase them; but not Buster! He just walks right on by it. There was a lot of information in this story about Ms. London's blindness which helps us understand more about blindness. It also tells us how to act around guide dogs, especially when they are working. I really liked the list of commands at the end of the book that goes through all the directions that Buster can do. Very cool! Besides information, this was a fun book to read. It didn't take me long to read it at all and I really loved it. Buster even got to fly on a plane and he was so well behaved. I don't think my mom would have been as good as Buster; she is scared to death of flying. I think everyone should pick this book up because not only does it help us understand more about guide dogs and it is really entertaining. You will definitely laugh at some of the interactions Buster has with other animals. The frog was probably my favorite! After finishing this wonderful book, I contacted the author and just knew I had to have her on to do a guest post for us too. London is a fun and sweet person and I recommend for everyone to read her book as well as letting her know. You will come away with a warm feeling from talking to such an optimistic woman! Without further ado, let's welcome Mrs. London Lake Pickett!!!! with Buster” is my next book. I will let you know when it is published! One's a Secret Agent, One's Not. Twelve-year-old Linc is a trouble-maker with a dilemma. His antics on a recent school field trip went way overboard, landing his already poor family with a serious lawsuit. So when two secret agents show up at his house, Linc is eager to take them up on their offer to make the lawsuit disappear. They just need one tiny favor. Turns out Linc looks exactly like one of their top kid agents--an agent who's vanished during a vitally important mission. But no debriefing can prepare Linc for how dangerous the mission really is. It's too bad he isn't a black belt, a math genius, or a distance runner like his agent double. He'll need all those skills and more if he hopes to make it out of this mission alive. . . . Yes this is an children's book but I found myself loving it as well! I would read it out loud to the boys and I would get quiet for a little bit, and then, Conner would say, " Mom! Stop reading ahead!" He was right, too! I was reading ahead! The excitement level is very high in this book and it will keep you on your toes. Linc is a wonderful, mischievous, interesting young boy that every child could relate to, especially my twins. He tends to get in trouble because of his class clown status and the fact that he is very curious. I swear the incident with the chickens (both times) had all of us ( even DAD) cracking up. I even seen Conner's eyes twinkle with ideas; so I am definitely not taking him around any chickens anytime soon. But besides all the comedy and interesting exploits Linc tends to make; there is a lot of mystery in this book. That is what kept me so enthralled! It made me think of Dan Brown's The Da Vinci Code only because of all the clues, puzzles, and tricks the characters needed to solve. In Double Vision, Linc is steady trying to figure out different clues and different puzzles that are taking him around France, trying to get a very special person's father back. This character is my girl! I loved her and I think just including her in this story makes Double Vision fun for girls, boys, and adults too! Anthony: So Conner and I are really into spy books; basically spy anything. We love all of the Spy Kids movies and we loved this book too! In fact, it reminded me a little of Spy Kids just because of the kid spies that are in the book. I really like the main character, Linc, a lot. He was funny and seemed to be liked by everyone, except the guy he was pretending to be. I think Conner and I could really hang out with him; he was really cool. Even when he got into a lot of trouble at the farm. Once cool thing was Linc's town he is from, Lompoc, is where our dad was born too. That was really neat! I also like Francoise and loved the fact that she was really good at fighting and figuring out really hard clues that her dad left her. I enjoyed reading this book alot! Our mom read it out aloud to us but the book was easy enough for us to read quietly too. The chapters aren't that long and for the most part we could understand everything. 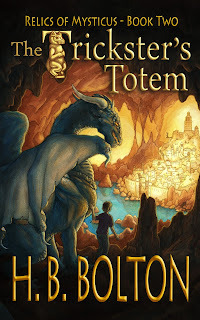 Conner: This book was awesome!!! It was fun to read and I always begged Mom to read "one more chapter" every night. Linc is a really cool boy even though he gets in trouble a lot. I really felt bad for him when he ended up getting his family in trouble too. You can tell he didn't mean it because he felt really bad for his Dad and Mom. I think Linc is pretty brave too going to France to help the government with some top secret mission. I don't think I could do that, although, it does seem a little fun too. I liked Henry alot. He was a really good friend for Linc and helped him out a couple of times with his really neat gadgets! Man, what I wouldn't give to be able to do what Henry can do! I loved the idea about the evil painting that was pretty creepy! But my favorite thing was the fact that Linc looks exactly like one of their agents. But Linc is way different too. That reminds me of Anthony and me; we are twins but we like different things. But sometimes people can't understand that. I wonder if we could pass as each other sometimes??? F.T. 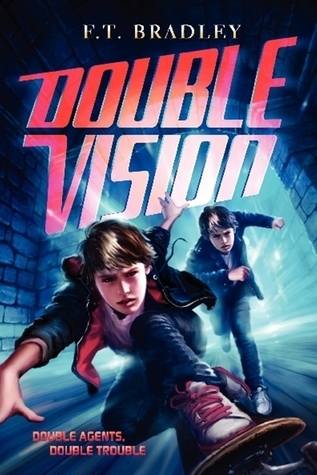 Bradley is the author of Double Vision (Harper Children's, Oct. 2012), the first in the middle-grade adventure series featuring Lincoln Baker and Benjamin Green. Her husband's Air Force career has F.T. and their two daughters moving all around the world, but for the moment the family lives on the Mississippi Gulf Coast. To find out more about F.T. and Double Vision, visit her website or www.doublevisionbooks.com, or follow her on Twitter. She likes to make new friends. Hi everybody! We have been so lucky to get a exclusive interview with the crew of the Flying Dragon from the series, Captain No Beard. I can't wait to see what is going on with our lovable captain as well as Hallie and the rest of the group. After the interview, make sure to enter into our giveaway to win signed copies of both books, as well as a pirate prize pack. We will have two winners and the giveaway is being hosted by Kids Corner For Super Reading and the author is sponsoring it for us. Alright lets join Carole while she interviews the most adorable pirates on the seven seas! On a warm, sunny day I had the pleasure of being aboard the Flying Dragon, with the ultimate pleasure of an exclusive interview with daring pirate Captain No Beard and his hearty crew. After lunching on peanut butter and jelly sandwiches, the captain's favorite, we sat down to business. The crew sprawled around the deck before me in careless abandon, a real treat to see them so casual. Q- So How long have you been together? CNB- Oh, (he was laughing) how about forever! The crew all chuckled at this. First Mate Hallie- Well really, Captain No Beard is two years older than me, so until Polly and our newest member Cayla joined us, I was the newbie. Q- Great!. So how about the rest of you? Mongo the monkey- I came home with the Captain from the hospital. I served as lookout from his bassinet to crib. All those looming people. He's the first grandchild. (Mongo shuttered) All that kissing. Someone had to watch out for the little tyke! Linus the lion-(Roaring) I have to say Mongo, that you might have watched over him, but Uncle Eric bought me to protect him. Sort of a double gift, the captain is a Leo, just like me. Q-You're awfully quiet here Fribbet. When did you come along? Fribbet the frog -Can't have bath time without me. Mommy bought me in a park somewhere for bath time. My job to make sure the water temperature is perfect. We've been avoiding hot water together for a long time. I like to give warnings, you see. Q- Oh, so you warn Mom when the water's hot? Fribbet- That's my job, Mate and I take it seriously. CNB- That's my Fribbet. He's a serious frog. Q-So you all know eachother quite well? This brought on an explosion of laughter. I guess they did. CNB- I knew I wanted to go to sea from the beginning. The water,the sand, the air..
CNB- Well, that's important for just a few in our crew. I like adventure myself. What better way than taking along your best friends. Hallie's a peach. She's always ready to tackle anything. Couldn't have done it without her common sense. Hallie- It's easy, when you have a great leader. Alexander, I mean, Captain No Beard always knows what to do. He's really good at this. Polly the parrot- Polly has something to say!!! Polly- I was an angry bird when I joined this crew. I was so mad because I was embarrassed I couldn't tell my right from left. Let me tell you about this group of jolly tars. They are sensitive. Polly- They not only helped me, but made me confident enough to ask for help when I needed it. Cayla- And they don't judge a book by it's cover, anymore either! Q-And you must be Cayla. Cayla- Yes, Mommy let's me join the crew in book four and what an adventure we had. Not only did we learn not to talk to strangers. ( The crew all nodded gravely at this) We learned not to diminish someone's' importance because they may be small or young. Help can come from anyone who is willing to try! Hallie- You said it lil cousin! Q-So what's on the horizon for the Flying Dragon? Linus- Barnabas the scurvey dog! Fribbet_ Crab Cakes! I hate crab cakes! Q- One at a time, please. CNB -Well, on our next voyage we are "Stuck in the Doldrums" and I ( here he is very embarrassed) learn a valuable lesson on sharing. Cayla- Don't forget my book "Strangers on the High Seas". Fribbet- Aye, that was a treacherous encounter! Hallie-(goosebumps clearly visible) How about the "Treasure of Snake Island". CNB- There weren't too many snakes,Hallie. Hallie- One snake is too many! CNB- We love to explore. No matter what we encounter from rough seas, to battered feelings, this crew can go anywhere our imagination takes us and come back better for it. A great group of friends that appear ready for anything. This interviewer left wondering where her own imagination could take her today. This giveaway is open to US residents only. Sorry guys but shipping can be murder on you internationally. I am such a huge fan of pirates. There is just something breathtaking about walking around saying "Aarrgh!" or "Ahoy Mateys!" that seems like it makes your day just a tad more fun. You should try it-you might like it. Talk like a pirate with your kids while you go about the chores or pretend you are the captain and they are your first mates. It will bring a smile to your kids' faces, and probably yours too. So my boys and I were super excited to find this cute little series about a captain and his unlikely crew sailing the imaginary seas. 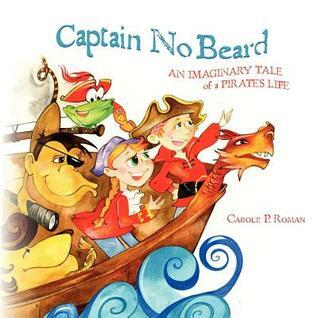 I think the title is adorable~Captain No Beard~ because he literally has no beard. He is a very interesting pirate captain, not to mention his shipmates as well. He has a mix of animal friends that help navigate on his boat, The Flying Dragon. For example, there is Mongo the Monkey, Linus the loudmouthed lion and of course, Fribbet the Floppy Frog. I love the alliteration that is going on right here. It is so much fun. In fact, I think that was the first thing my son, Mikey, pointed out to me. This isn't specifically a "learning" book; but I do think it could be if you really wanted it to be. I do, however, think this is a great teaching tool for imagination. I appreciate the fact you have the adventure the crew goes on and then always at the end, the captain and his first mate, Hallie, find themselves back home. I think this book is great for both sexes as it doesn't really play to either one. It is just fun to read, fun to pretend with, and fun to imagine. Captain No Beard is a very funny pirate that is a kid just like me. I love the monkey; in fact he is my favorite. It is cool to say his name: Mongo the mast climbing monkey. I laughed really hard when Captain No Beard pulled out a dictionary to look up the famous pirate phrase, "Shiver Me Timbers". And after everyone figured out what it meant they ran off doing their chores on the ship. My little brother and me started saying that while we were cleaning our room. It was pretty funny. My favorite part was when Mom would read us the different pirate phrases, using her best pirate voice. And then she would tell us we needed to repeat the words so we could be pirates too. We were honorary members of the Flying Dragon. Besides his first mate, all of his crew is animals. I love animals! I did wish he had a dog since dogs are my favorite animal in the whole wide world. Oh and the pictures in the story were very cool! Source: received with first book from author in exchange for our honest opinion of it. I know my kids (and myself) can always use patience when it comes with dealing with many issues we face everyday as part of a family, part of a community, and even being part of this world and this great little story helps us see why. Ya'll know I love my alliteration and there it is smack dab in the title! This was a wonderful story to read with my kids. I even found my older, more mature, (yeah right) nine years old twins listening in and chuckling at Pepper. That is actually one of my favorite aspects of the book: the humor Ms. Roman works into it. It is simple enough for the kids to get a kick out of it but even the adults can smile at the Pepper Parrot and the crew's patience or lack thereof. I think this book has a bit more of a learning vision than the first book because of course, patience is a virtue we could all have a little more of. Especially Pepper the Parrot. 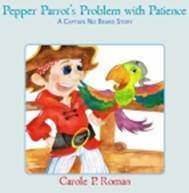 I think Pepper Parrot's Problem with Patience could be a great teaching tool for kids as a fun imaginative read that helps children unlock their potential to do great things. As long as they can be patient enough for those great things. This is a great book with lots of funny parts! We all decided that probably the best part is when the crew and Pepper is trying to figure out what left and right is and Pepper keeps getting confused! It's also cool that the trick Hallie teaches Pepper to learn left from right is the same trick our mom taught us too! That is pretty amazing! Another funny part is when everyone keeps saying, "AARGH!" all the time. Conner laughed so hard he snorted and then everyone was laughing from that too. We did have one question though: How was Pepper the Parrot going to be the cook?? That would have been definitely a funny sight! What a beautiful and promising story for children and adults alike!! The illustrations, the sweet characters, and the inspiring plot come together to bring us a wonderful story about a little star that learns to shine as bright as he can, just being himself. The pictures are bright and happy, keeping my youngest child as well as my oldest ones interested throughout the whole story. Even though this story is about a star we can all learn from what Can't goes through with his fellow stars as well as learning to believe in himself. The issues portrayed in the story can be helpful for young adults just like the small kids too. We all go through some type of bullying; dealing with our peers isn't the easiest thing to do but we see how Can't is able to get through it being different from the other brighter stars. Another issue we are faced with that is discussed in the book is confidence. I, myself, still find it hard to get my confidence where it needs to be to do the things I want to do-like writing. I see this same problem in my son, and he was excited about the book enough he wanted to help with the review. I was very impressed with this story and love how the message teaches children how to cope with teasing and still embrace the beauty in being different from others. I think any parent could use this helping tool to show their own kids how they can go from thinking of themselves as a "Can't" to a "Can"! I learned a lot from my Mom. But this story, Can't and Able, helped a little too. It's okay for kids to be different. For me that is really important because I am a twin so I can really enjoy being different. Mom always says being different is fun because if everyone were the same it would get really boring. Well it is never boring out our house! I really liked how Can't knew he couldn't shine as bright as the other stars, but he still did the right thing when Able was in trouble. Just because they were mean, didn't mean that Can't had to be that way too. Another reason I liked this book a lot was because the characters are stars. They look like really friendly stars too. I thought it was pretty cool because my parents are always telling my brothers and me that we should always reach for the stars. Oh and never say you can't do something; but instead always say "I can!" Now I am starting to understand why that is now. 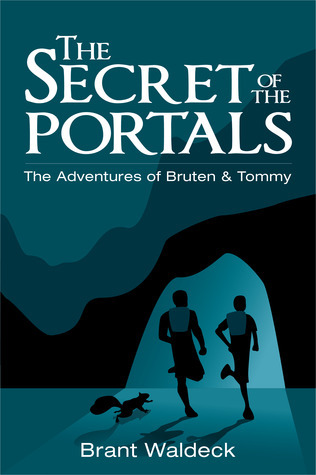 Bruten Stone and Tommy Staunton discover secret portals to other worlds... right in their own town! It's an adventure like no other that leads them to amazing worlds and untold riches, but it soon becomes clear that they will have to defend the worlds from those that would like nothing more than to exploit them for profit. As two recently graduated 5th graders, are they up for the challenge? This is one of those books that would be a perfect anthem for young boys. It has adventure, exploration, unexpected characters, and two best friends. I would even imagine some girls, that are a bit on the tough tom-boyish side, would benefit from the story too. As an adult, the story did flow a little slow for me; but I think my sons, however, loved the flow and rhythm of the book. It also helped that there were fight scenes back to back to keep one's attention at all times. I would even think that those kids that aren't big on reading, could enjoy the different fantastical elements included here, and may find a new respect for books. How cool would it be to set out to explore, in the woods, pretending to be warriors visiting other worlds, then actually find portals to different planes of existence? I really enjoyed the vast imagination Mr. Waldeck has as he puts his creativity to use personifying animals and stones. I also enjoyed how our author took two characters that are pretty different in many ways, like Bruten is the athletic one where Tommy is more of the thinker, and he made them best friends. Secret of the Portals is a great fantasy story for middle grade readers and younger, with lots of excitement that is fun to read to the kids. And there is a twist that will make even the adults sit up and take notice. What a great little story with some very positive attitudes for boys and girls to always believe in yourself and in the right honorable way to do something. I give it four stars! Brant Waldeck lived in a small town in rural Ohio until he was fourteen years old. From there he moved to a suburb of Columbus, Ohio. After high school, he attended Miami University (OH) and graduated with a degree in marketing. After five years working at advertising agencies, Brant set out on his own to be a freelance designer. His business evolved into a successful marketing agency. His life revolved around creativity, but it wasn’t until he had kids of his own that Brant began to explore the idea of writing. Brant credits his children as the key to his creative inspiration. The minds of children see possibilities that adults tend to shut out. The trick to being creative... never stop thinking like a kid. 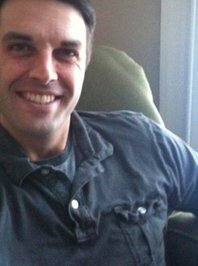 Brant currently resides in a suburb of Charlotte, NC with his wife, Jenny, and three kids, Gillen, Brannen and Braelyn. I laughed at the cover of the book. I loved the "S" and that it was a snake. My brother loves snakes so I knew he could really like this book too. I loved all the colors and different pictures for each capital letter. MY favorites were "O" and "J", especially since my name starts with J. Right now my mom and I are working on learning the different sounds and how to write the letters in the alphabet so this book was a fun helping tool for me. 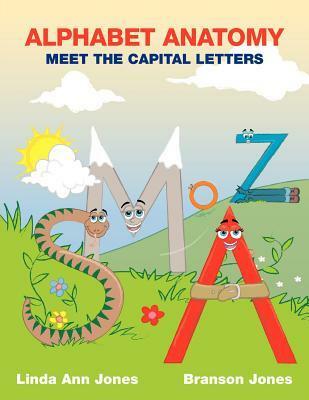 If you are learning your ABC's then you should pick this book up for you next time you want to get to know the Capital Letters. I remember back long ago when I was in first grade and there was this poster that hung on the wall in my classroom. I used to love to stare at that poster and make up different stories about it each day. What was the poster you asked? It was the letters of the alphabet made to look like people. I loved it! I still think back to it and know that it was a very helpful for me to become as enthralled with learning as I am even now. This book brings back those wonderful memories and helps establish that same attitude with my kids as I had when I was younger. It is so much fun to personify objects ( in this case the basis for our language) into lovable characters we can relate to and laugh at; but most importantly enjoy and learn from. If the illustrations weren't enough, this book also has rhyming. And I am a firm believer in the fact it is easier to learn anything as long as it is in a enjoyable rhyme. The only gripe I had was some of the words were a little hard to understand from a child's standpoint. Deft, gait, and some other words that may have been a little advanced for my four year old. (Actually, my older kids asked what deft meant too) This isn't necessarily a bad thing; I just mention it because my children asked what these words mean. Other than that we loved the book and are looking forward to Meeting the Lower Case Letters when that book comes out. We give it four stars!!! My grandchild, Jace, couldn't wait to let me see the book he received in the mail for him to review. I have been working with him trying to get him to love the alphabet as much as his older brothers do. He has been a real working progress since he tends to want to do what he only wants to do. But I noticed he was genuinely excited about reading this book with me and his mom. He loved the way "J" was described and kept adding that "Jace" also starts with the letter J.
" He's 2 bellies fat, from eating big burgers all day as he sat." I also liked how they used different words as well as old reliable words for the guides for the letters. For example, you had A is for apples but instead of D being for dog it was for dive. It worked with the description and explained how to write D.
I did notice there were a few words the older grandchildren asked what the meaning was but Jace was too mesmerized by the pictures to worry too much about the words he didn't understand. Perhaps, the author added these words so this book could be used in the later grades because it still offers a learning experience, even after you learn your ABCs. I enjoyed it too and I would like to give it four stars too. Little Dino must learn that even though he has nice, sharp teeth, he can’t bite anything — or anyone — he wants to. For the youngest learners, fun, cheerful read-alouds that help guide a child’s first steps in learning and growing. With bright, bold art and humorous stories, the Little Dino books focus on troublesome behavior in a fun but constructive way. From the Little Dinos/Hello Genius series. For ages 2-4. I laughed and laughed at everything that Little Dino does in this book!!! He tries to eat everything, or just bite it anyways. The creepiest part (and funniest) was when he tried to bite his Mom's tail. His Mom was not happy about it either. I think this is a really good book because it teaches little kids, like me, not to bite things that are not good for us. Instead we should bite apples, crackers, and cheeses. These are healthy foods for us and they taste good too. Oh and it is definitely not good to bite people. Trust me, you will get into a lot of trouble for this! A lot of trouble! This book was short, sweet, and very helpful for a four year old that loves to chew on every single toy he gets. Besides the wonderful message instilled in these colorful pages, the illustrations is probably what held my son's interest the most. He loved watching Little Dino as he took bites out of everything he wasn't supposed to, and even laughed when he tried to capture his mom's tail in his mouth, which Jacey commented, "No,No No!!" Jacey even wanted me to read it again and again. I also noticed the older kids sneaking into the living room to look at the colorful book; as well as the occasional giggle that came from the boys. This is a sweet little book that helps address a common problem among toddlers and preschoolers (present company included, Jacey). I encourage you to pick this book up if you have that little Dino, that likes to bite things other than food, in your life. I think I will give it five stars!